I realized I never really wrote about all of the inauguration excitement. For those of you who live in DC, you know how crazy things were and how the general atmosphere of city was just heightened and everyone was (and still is) in a better mood than usual. 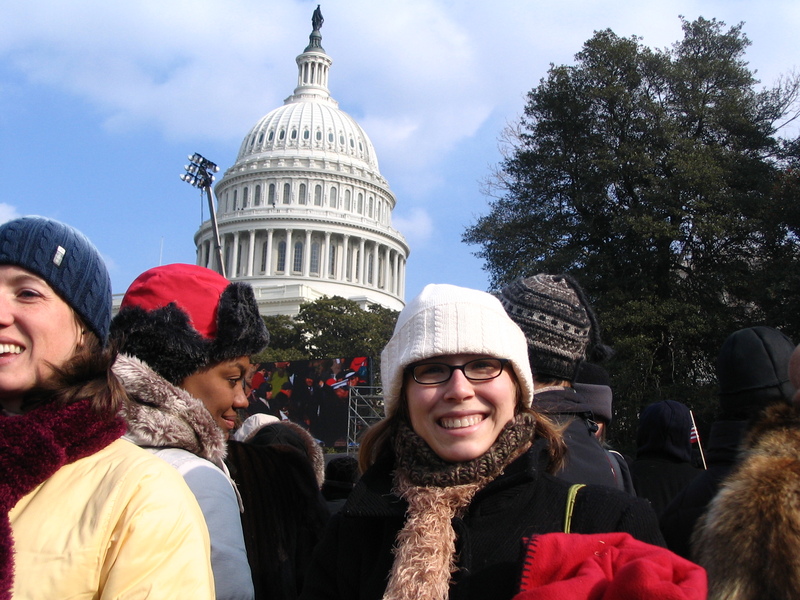 For weeks I had debated whether or not I would actually make my way through the crowds and the cold down to the festivities, and in the end, my friend got us tickets on the Capitol lawn, so that sealed the deal. I woke up at 6am, and after my friend picked me up and we parked his car back in Dupont Circle, we literally jogged to where our gate was. I was bundled up in about 6,000 layers and wearing snow boots, so by the time we got there, I felt like I had had a complete workout. And then the cold set in, of course. A few hours after waiting in the blue gate line just to move a couple of blocks, we made it onto the lawn with time to spare. We didn’t have a direct view of Obama, and were cut off by the corner of the building, but we were close up to a jumbotron, and being on the lawn still made it feel pretty cool. The moment was awesome, and I was glad I had ventured out. That evening, I conked out on my couch, much like I had done 2 days earlier after attending the Lincoln Memorial concert. Being out in the cold is exhausting! I doubt I would have lasted very long at a ball or other shindig. Now that Obama is President Obama, it’s great to look forward to the work he’ll do to bring about a fresh face to our country – and he’s already gotten a great start with things like repealing the global gag rule, passing the Lilly Ledbetter Act, and pushing for a stimulus package. Not to mention, he has a sweet White House website, thanks to my former colleague, the amazing designer, Matt Ipcar. It’s pretty cool to live in DC right now…and I’m sure it will only get better!